Facebook, online social networking with the largest number of active users reaches 200 million (as of January 2009), now officially present to the device based on Windows Mobile operating system version 6.0 and above. Previously, the Facebook application for Windows Mobile, was outstanding in March and to try to test. Now, Facebook has officially announced that the application has been launched. Facebook presenting a number of special features that are not owned by another user OS. 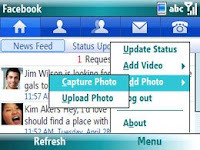 Through this application, users are allowed to upload video directly to Facebook, and this ability is only possessed by WinMo. In addition, the phone book by in the pages of each user profile can be integrated with the Windows Mobile device. That way, users can easily contact friends must save the number without the first. Other features, ie, send messages to anyone on the list of friends, upload pictures or photos directly to Facebook, make calls to anyone on the friends list, manage your profile and also status post comments. Please visit http://www.microsoft.com/windowsmobile/en-us/downloads/facebook.mspx to download Facebook application for Windows Mobile.